HELPING HANDS: "We help people who want to stay in their home environment. We provide the equipment that can make it possible. It allows them that possibility, and helps the family and caregiver to help the patient." Gail Morrone (left), manager, and Kathy Horvath, co-owner of SMH Surgical Supply, take a moment to relax in the patient chair lift. For individuals faced with long-term health problems or for those in rehabilitation after an injury or surgery, SMH Surgical Supply fills an important need. Whether it's walking aids and accessories, wheelchairs and motorized scooters, or hospital beds and lift chairs  a full range of products, including bariatric equipment for seriously overweight patients, is available. PERSONAL SERVICE: "Here, we keep the same employees, and we welcome the patients and do our best to help with their problems. We go out of our way to get medicines the same day, if possible, and we will also obtain hard-to-get medicine. We try to help with customer's insurance problems, and we call their doctor to get refill prescriptions. We have a pharmacist on call 24 hours." 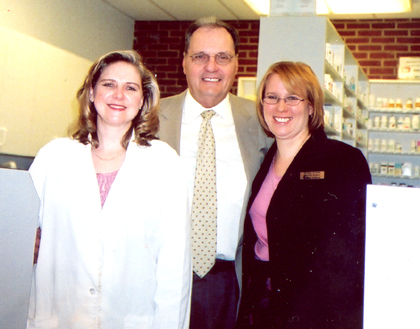 Steven Zagoreos, owner of the Princeton Pharmacy, is shown with his daughter-in-law, pharmacist Donna Zagoreos (left) and technician Colleen Goeke. In an age of diminishing independently-owned stores and rapidly increasing chains, The Princeton Pharmacy, Princeton's home town apothecary shop, is a reassuring presence. Located on the first floor of the Princeton U-Store, it opened in 1989, and has become a mainstay in town. Proprietor Steven Zagoreos, who also owns The McGrath Pharmacy in Lawrenceville and The Monument Pharmacy in Trenton, has seen a myriad of changes in the business since he began working in the 1960s.